Cheap credit is making a comeback, at least for some customers: Big banks and credit card companies are ramping up their 0% interest rate offers again. Bank of America (BAC) is offering to some customers 0% interest on cash advances and balance transfers through June 2012. J.P. Morgan Chase (JPM), Citigroup (C) and Wells Fargo (WFC) are making similar offers, according to Bloomberg. If this feels like a flashback to pre-recession days, it should. But the game has changed in key ways since 2006: There are more fees and tougher credit score thresholds. The upside for qualified customers is that fierce competition between credit card issuers means promotional rates will last longer. Some, like Citibank's Citi Simplicity credit card, have 0% interest on balance transfers for up to 21 months. Zero-percent offers are a good way for card issuers to add new customers while managing their own exposure to risk, says Greg McBride, senior financial analyst at Bankrate.com. With transfer fees now between 3% and 5%, credit card companies can make a small profit right away, which can offset the loss of revenue during the 0% period. Another factor that's driving the low-interest lending trend is the feeling within the card industry that all the regulatory changes stemming from the Dodd-Frank Act and the Credit CARD Act have been now put into place, said Ben Woolsey, director of marketing and consumer research for CreditCards.com. "They are feeling much better these days," he says, "and that is reflected in how aggressive they are being with promotional rates and direct-mail offers." Doug Miller, senior analyst for banking and cards with Corporate Insight, says the zero-percent balance transfer offers never actually vanished, but what is different in the recent wave of offers is that the teaser rates extends to new purchases as well. And of course, credit card companies are hoping that new customers will stick around long after the great introductory rate goes away, and perhaps also nudge up their spending under those temporary low rates amid the distant ring of holidays bells. Current low-rate offers are aimed at customers who already have credit scores from 730 to 750 and above. 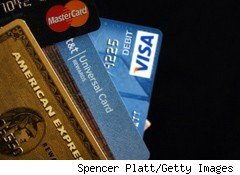 Anyone with a FICO score lower than of 700 is unlikely to qualify for these promotional deals, says Curtis Arnold, a credit card expert for CardRatings.com. For those who qualify, not all deals are created equal. It's vital to examine all the details of an offer. Much the key information can be found in the Schumer Box, a table of fees, terms and conditions that required by law for every credit card. First look for the teaser rate, which hopefully will be 0%, and then what the rate will jump to when the teaser period ends. For many cards, the "go-to" rate rises to anywhere between 11.9% and 20.99%. Next, look at the length of the teaser offer. Many products offer far more than 12 months: Some are in the 15- and 18-month range, and a few last up to 21 months. Make sure you clearly understand the terms and caveats: Often, you can lose the promotional rate by being late on a single payment. Calculate the fees. Balance transfer fees are hovering around 3%, but some are as high as 5%. Online calculators provide an easy way to calculate costs and savings benefits of making a balance transfer. For example, a balance transfer of $8,000 with a 3% transfer fee adds up to an extra $240 on the debt. By using the 21-month promotion to pay down the entire dent, that new total of $8,240 can be paid off with payments of $392.38 a month. Compare that to keeping that same $8,000 balance on a card with 12.9% interest. To pay it off in the same 21 months would require payments of $427.60 each month. That's a savings difference of more than $35 a month, and almost $740 overall. Convenience checks offered by some credit card lenders might appear like a good way to get a short-term, interest-free loan but those typically also come with a 3% to 5% fee, says Woolsey. That limits the opportunity for enterprising customers to borrow from a credit card and invest the cash in an interest-bearing deposit account or CD to make a little money on the margin. If moving a balance to a new card makes financial sense, credit card experts advise against closing the old account, especially if it's one you've had for a long time. Maintaining a lengthy credit history is key to keeping a solid credit score. However, finding the lowest rate for the longest term possible is only the first piece of the puzzle. The second, more important step, is to actually use that low rate to facilitate paying off your debt. "Use it as a tail wind to repayment," says McBride.